With one of our innovative thermostats, you may be able to increase your Cornelius, NC home’s energy efficiency. 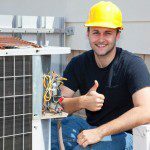 When you think about how energy efficient your home is, you probably relate it directly back to the HVAC unit sitting on your property in Cornelius, North Carolina. However, the thermostat your home uses can also play a large role in how efficient your property is and what you pay to heat or cool your home every month. • A new thermostat can help you cut back on your energy bills. • You can upgrade to a programmable thermostat that controls your home’s temperature based on pre-determined settings. • You want to be able to control your home’s temperature from a location other than your home. Some of the most popular thermostats we have to offer are our Honeywell WIFI thermostats. These thermostats allow you to easily change the temperature of your home while you’re at work, while you’re out running errands, or even while you’re on vacation. If you aren’t sure which of the thermostats we have to offer will be the best fit for your home and your individual needs, we would be more than happy to provide you with guidance. At Cool Comfort Heating & Air, we are committed to helping you ensure the comfort and energy efficiency of your home with our solutions. To find out more about why you should replace your old thermostat and how we can help, give us a call today. At Cool Comfort Heating & Air, we proudly install high-quality thermostats in Mooresville, Huntersville, Cornelius, Denver, Troutman, Lake Norman, and Davidson, North Carolina.